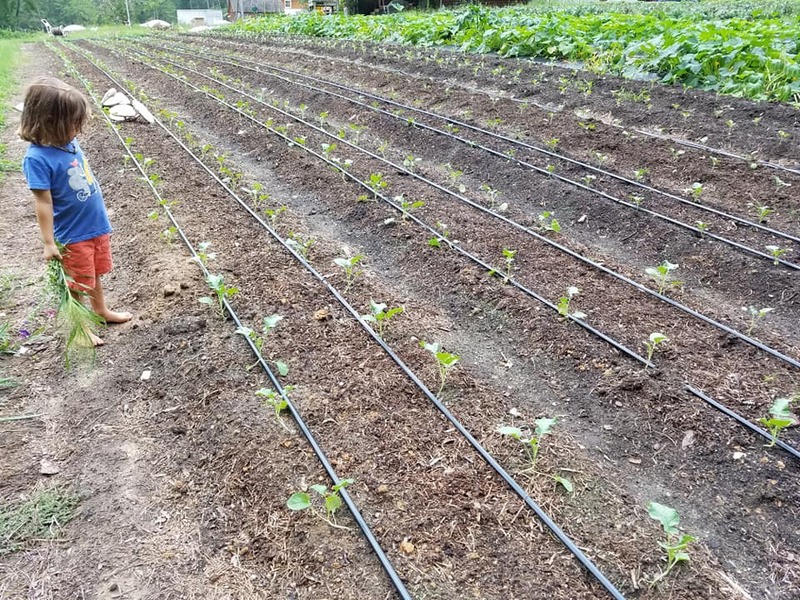 A large part of the reason we operate our farm as a CSA (Community Supported Agriculture) farm and why we send out these weekly newsletters is because we value helping our community learn about farming. Our backgrounds before starting Broadfork were largely based in farm education and other forms of non-traditional education. We think people should have access to information about how food grows! We all eat, multiple times per day, right? What allows that habit to continue? What changes the food available to us seasonally? What changes its flavors within a season? We can’t provide the answers to all questions, nor dedicate ourselves to full-time farm education (we have people to feed!! ), but we enjoy being able to provide bits of info. In here today is a brief overview of the differences between the seasons of the year here in Central VA, a bit about the impact of a rainy summer here, and announcement of a meet up happening here next month in which you can visit in person and learn more. 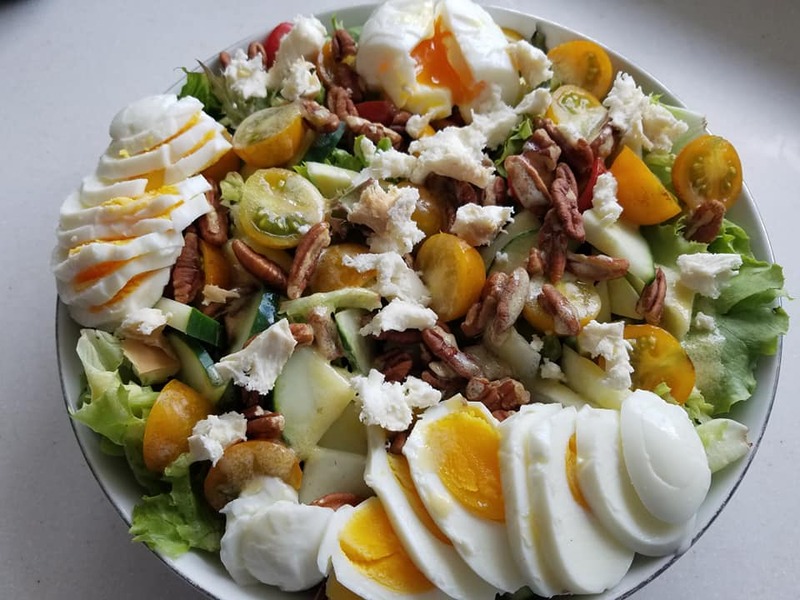 Amongst the abundance of summer fruits (defined by the presence of seeds inside the part we eat…tomatoes, peppers, eggplants, squash, okra, watermelon…), it’s understandable for people to be craving root crops, leafy greens, or other cruciferous vegetables (broccoli, cabbage, etc.). We have significantly fewer leafy greens this time of year, and no cruciferous veggies or root crops. Why? Because those vegetables hate the heat! They love the mild temps of the shoulder seasons (spring and fall). Summer crops are summer crops because they need enough heat for long enough to mature into the plump “fruits” that we enjoy. We can grow a few a few salad green varieties in the summer heat, but not many. We get to grow root crops and leafy greens in the winter because we grow in hoophouses that allow us to extend the season through the coldest months. These are the basic points of eating seasonal vegetables in our climate. Some of the nuance of seasonal eating related to the difference between one summer season and another summer season (or winter to winter…or fall to fall…) relates to the weather of that particular season. Sometimes that is easy to see. A super-wet spring may make all of our carrots rot in the ground before they are big enough to harvest. (This happened in 2017.) An extra cold winter may kill everything but the most cold-hardy of crops (for us, Spinach….and this happened in 2018). An extra cool and rainy July means more salad greens than usual (this was last month). A hot and dry July means fewer salad greens than usual (perhaps this will be next year!). 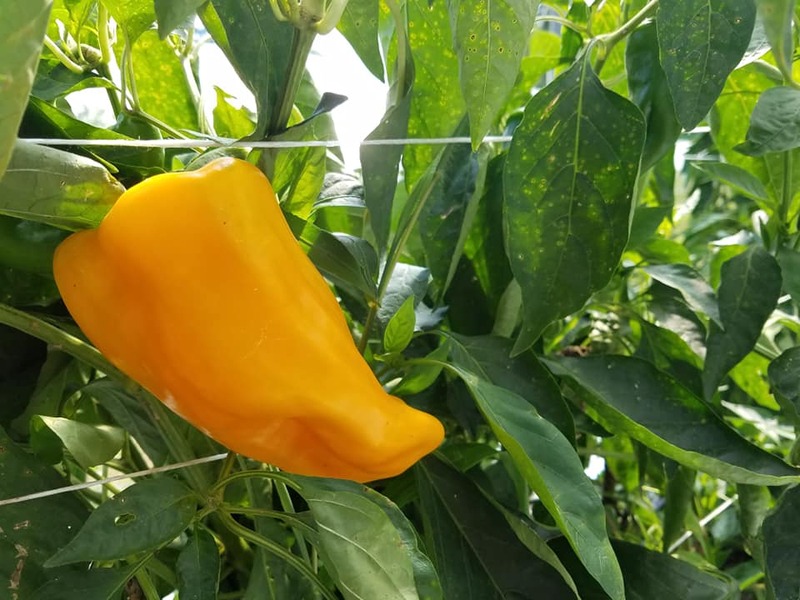 A dry summer can mean sweeter produce of this type, as long as there was enough water in an irrigation source to keep the plants alive. (Google “Dry Farming Tomatoes” for some interesting reads.) An extra rainy summer also means water-filled produce take in more water and therefore tastes more watery and less sweet (that is the case for our tomatoes and watermelons this season). People generally know that weather profoundly affects agriculture, but likely few people realize the ways specific weather patterns affect the taste of the food. Cantaloupe in particular need cool nights and warm days to sweeten up. We don’t grow Cantaloupe, but we love hearing the details of how certain regions grow the best tasting fruits because of their tendency for particular weather patterns. 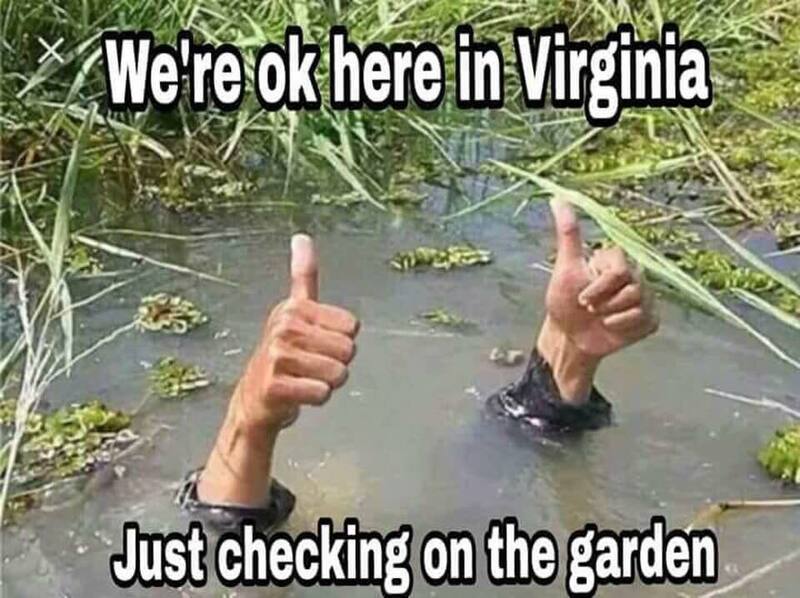 (And our area is not know for cool nights this time of year!) The time of day in which a particular crop is harvested, especially lettuces, dramatically affects the taste. Carrots and Broccoli harvested after the fall frost taste sweeter than those harvested before, as starches in the plants convert to sugars in order to better protect the plant from the cold. So much detail! All that to say, we hope some of you are learning via us and realizing the reasons why we are harvesting different foods at different times and why some foods taste differently from one harvest to the next. Join us next month in person to learn more! We are happy to be hosting the September meet-up for RVA Makers. 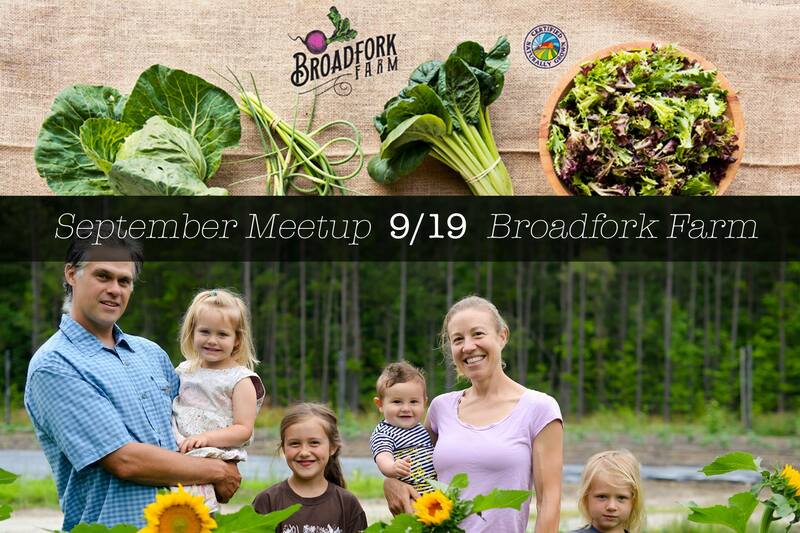 Wednesday, September 19th from 6-8 pm we will gather, talk about how we farm, explain some of the techniques we use to farm without tractors on a small piece of land, and enjoy some snacks. This is open to everyone and family friendly, though please be sure to leave your pets at home. RSVP on the Facebook event page. And – check out this outdated family photo!! – A cooler and rainier-than-usual July here meant for greater-than-expected harvests of certain crops. That meant some Farm Shares in July were bigger than average. – The abundance of rainfall and general moisture in the air means plant foliage of certain crops die from fungal disease faster than usual. Thus, we are anticipating August harvests to be less than expected. Accordingly, some Farm Shares in August will be smaller than expected. **If there’s anything that you don’t want from the share, you are welcome to leave it in one of the crates that hold tomatoes. Green Beans – You can get fancy, like with Charred Snap Beans with Whole Lemon Dressing and Mozzerella, or simple, like with Sesame-Soy Green Beans, or in-between with Green Bean Salad with Asian Dressing. For a light and refreshing take, try Green Beans with Mint and Lime. Or you can simply break them into pieces and add on top of a green salad. Tomatoes – We made this Super Simple Tomato and Garlic Sauce twice this weekend because it was so good. It’s just Garlic, Oil, Salt, and Tomatoes, but it’s delicious. It’s caramel-y and garlickly and extra yummy. We served it over pasta once, and alongside a chunk of protein once, and beside cheese-stuffed roasted peppers both times. The second time we made it, we added in some diced Mint and loved the extra touch. Other Tomato ideas: Make Grilled Cheese Sandwiches with Slices of Tomatoes between the cheese and the bread. Sweet Peppers – You can make Chicken & Cheese Stuffed Peppers or copy our five-nights-a-week habit of making very, very simple Cream Cheese Stuffed Peppers. Our younger kids are in charge of this on their own. They cut and take the seeds out of the peppers. They shmear a bit of cream cheese in each one. (It doesn’t take much. The internet always shows peppers overflowing with cheese, but we stretch it further than that.) They lay them out on a baking sheet. Then they sprinkle our favorite herb blends on top. You can also sprinkle Panko or other bread crumbs on top. And this weekend we fell in love with sprinkling diced Mint on top of all of them. Us adults would prefer diced garlic in this mix in the peppers, but the little kids haven’t graduated to garlic mincing yet. Soon! We think Peppers are the new Tomatoes, so try Roasted Pepper Caprese Salad. 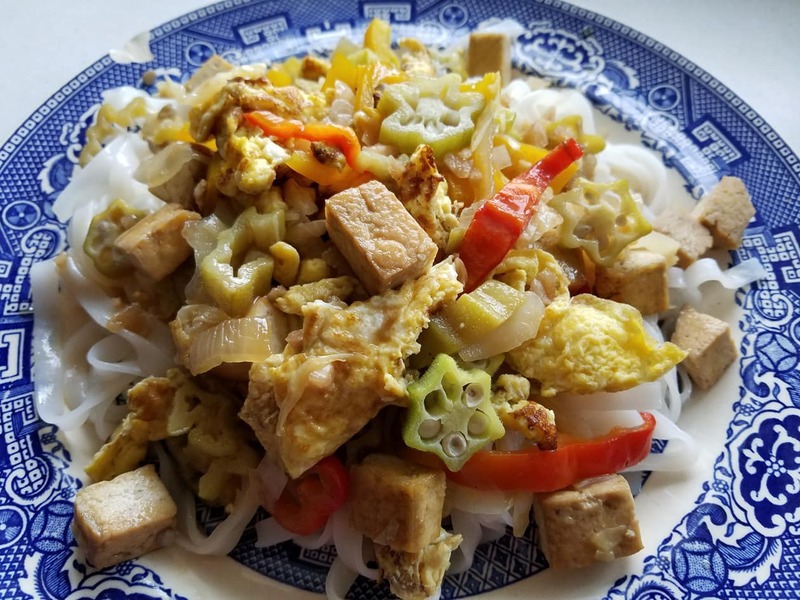 Okra – We put our Okra, sliced, in a basic vegetable and tofu stir-fry last week and topped it with a pad-thai-like sauce. We were – again! 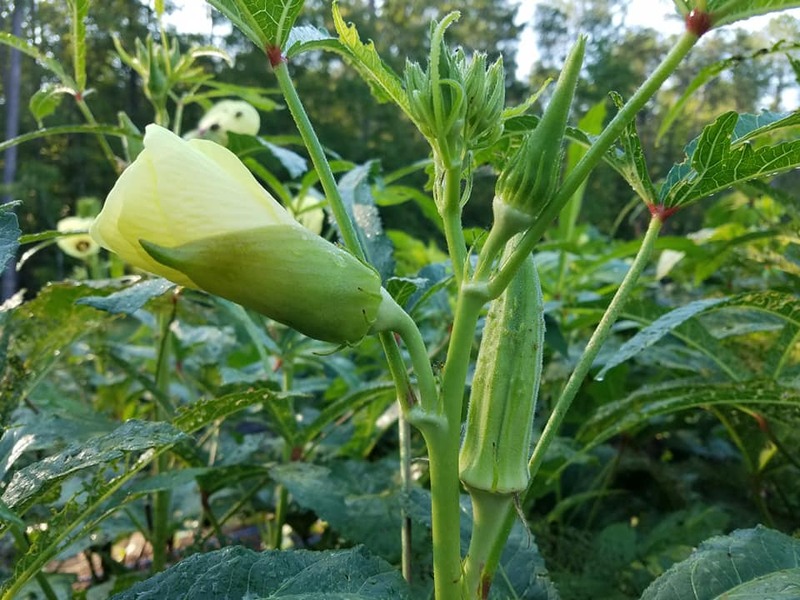 – surprised at how little slime this variety of okra has. It was very delicious in the stir fry. You can use chicken in a dish like that if you prefer, and you can make a simple sauce like in this Easy Pad Thai recipe. Rainbow Chard, Cucumbers keep plugging along in small amounts, Italian Eggplant (Beatrice), Flower Bouquets, Garlic, Green Beans, Lettuce, Okra, Onions, Sweet Peppers (bullhorn shape and bell shape), Shishito Peppers, Summer Squash, Tomatoes, the last few Watermelon…and our Organic Hearth Baked Bread (Roasted Pepper & Onion, Whole Rye, Raisin, & Seed loaves for this weekend).